Summary: Growing up, Kate Priddy was always a bit neurotic, experiencing momentary bouts of anxiety that exploded into full-blown panic attacks after an ex-boyfriend kidnapped her and nearly ended her life. When Corbin Dell, a distant cousin in Boston, suggests the two temporarily swap apartments, Kate, an art student in London, agrees, hoping that time away in a new place will help her overcome the recent wreckage of her life. I was late to The Kind Worth Killing fan club of Peter Swanson, but after I read it, I knew I wanted to check out future books. Her Every Fear is good. It’s twisted. It’s not all over the top violence or gore, but a cat and mouse game that has deadly consequences. And can I just say that if I was Kate Priddy and dealt with what she dealt with in London, then came to Boston and things got shady fast- I’d change my name, my hair color and start ordering all my food to be delivered.. Yikes! The cat and mouse game. Who was the cat? Who was the mouse? It kept me flipping pages! How character driven this book was. We got in deep with these characters. Bottom line: I did really enjoy Her Every Fear, but something kept me from loving it as much as I loved The Kind Worth Killing. 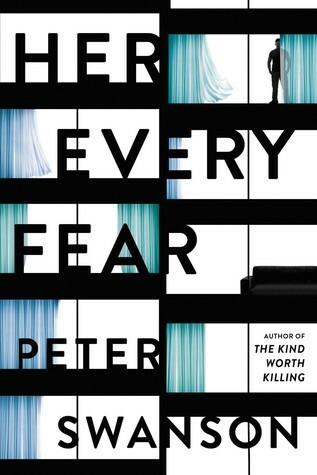 Her Every Fear is def worth reading though! I still need to read his first book – it’s on my kindle. Your thoughts on this book are in line with some of my GR friends. I just enjoyed the 2nd book much more. I haven’t read the first book, tho.